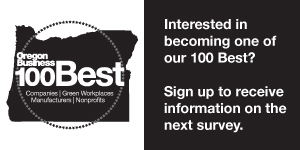 Each year since 1994, Oregon Business magazine has been proud to present the 100 Best Companies to Work for in Oregon. The aim of the project — a survey conducted in the late summer and fall with results published in March — is to recognize and celebrate Oregon companies for their commitment to creating great places for their employees to work. An easy process that gives you critical insight into your company's strengths and weaknesses along with the chance to rank among the 100 Best Companies and the 100 Best Green Companies to Work For in Oregon. Find out whether your company can participate, how the employee survey works, how companies are scored, when the deadlines are, what promotional opportunities are associated with the 100 Best, etc. Here are some great reasons for your company to sign up for the 100 Best survey: it's free, easy to facilitate, provides honest feedback and can boost workplace morale. How to engage employees in the 100 Best process, boost the number who take the survey and receive the best, most honest feedback on your workplace.